Scores were close at the top with the final result in doubt until the final range. The top 3 scores were only separated by 2 points and only 15 points separated the top 16 scores which shows a smaller spread of scores compared to previous years. 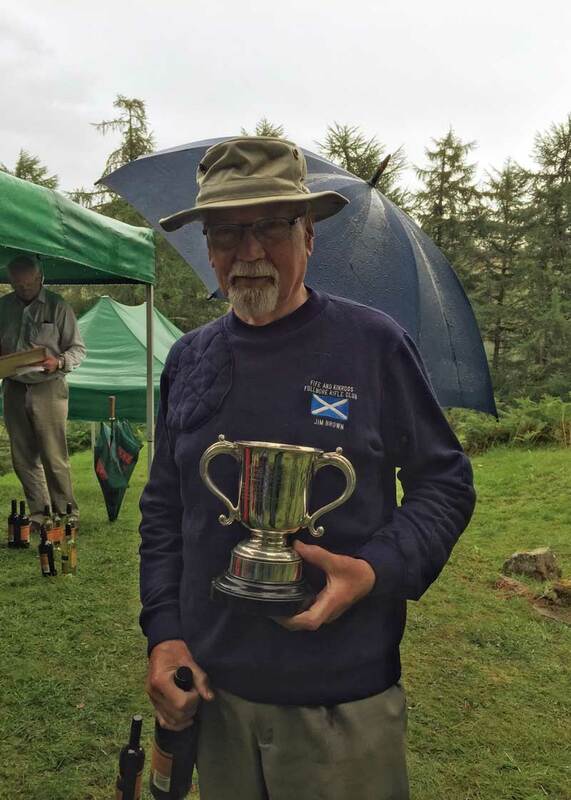 Many thanks to John Hissey for presenting the prizes at the end and for supporting the event over the years since the first Autumn Meeting at Blair Atholl in 1987. 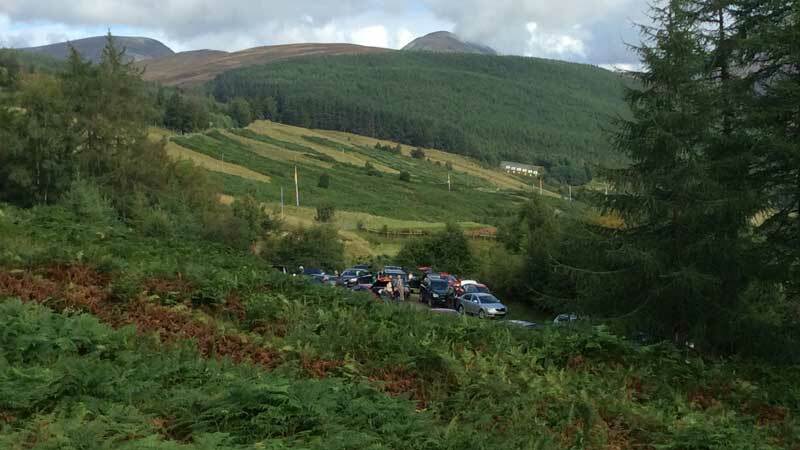 As participants, and their supporters, converged on Blair Atholl, the centre for Full-Bore shooting in Scotland, they knew what Glen Tilt would throw at them over the next two days – rain, mist, sunshine, glorious scenery, midges, potholes, rainbows, parking, capricious electro-targetry – all of which materialised to varying extents. What they did not expect to hear on arrival was the very sad news of the death of Alastair Munro on the previous day – just nine days short of his 100th Birthday. Erstwhile Captain of the Scottish Twenty, Alastair had been a dominant figure in Scottish Shooting for over fifty years. He will always be remembered for his singular role in the creation of the Jubilee range following the demolition of the Home Guard range to make way for the realigned A9 trunk road. 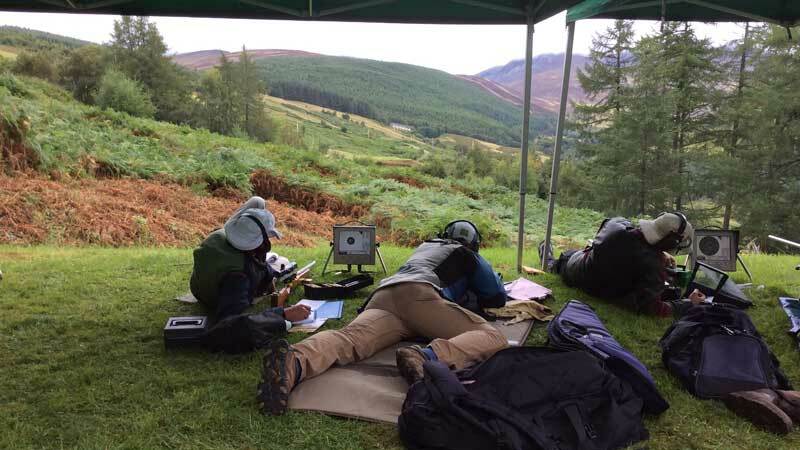 Alastair’s intimate knowledge of the Atholl Estates through his position as Assistant Factor enabled him to select the ideal site for a range on one side of Glen Tilt – the very site which Queen Victoria had so admired in 1856. Alastair conceived, designed and constructed the range single-handedly – in more senses than one – and the official opening took place in 1977 jointly by the Duke of Atholl and Sir Ronald Melville. 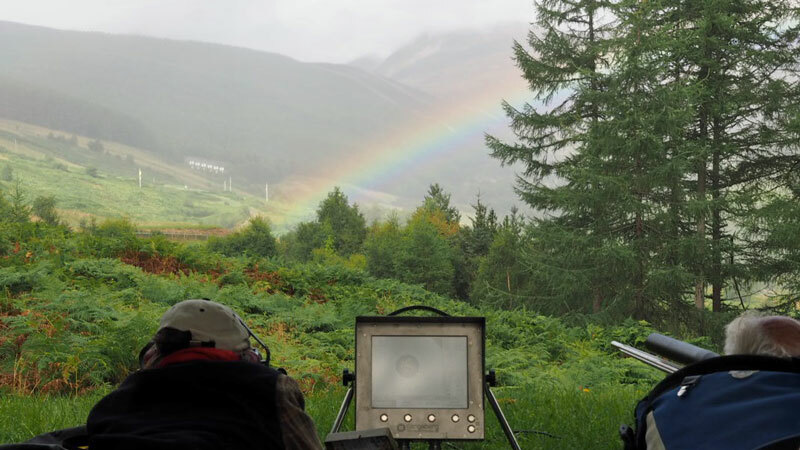 It is no exaggeration to say that that the creation of the Jubilee range, entirely through Alastair Munro’s own vision and hard work has enabled the survival of Full-Bore shooting in Scotland. This was acknowledged in a short act of remembrance prior to the start of shooting on Saturday morning led by the Captain of the Scottish Eight, Mike Baillie-Hamilton. Shooting proceeded without incident throughout the first day in fine weather and with well-behaved electronic targets. After nine details proceeding through 987, 1114 and 1233 yards and approximately 1550 scoring shots Mike Barlow was top gun having dropped just two points, with Julian Peck one point behind. A first for the Jubilee range was the appearance of the Table (mensalist?) position. Neil Fyfe had been developing this style of shooting over the past year – seemingly with some success as he carded 99’s at both 987 and 1114 yards. 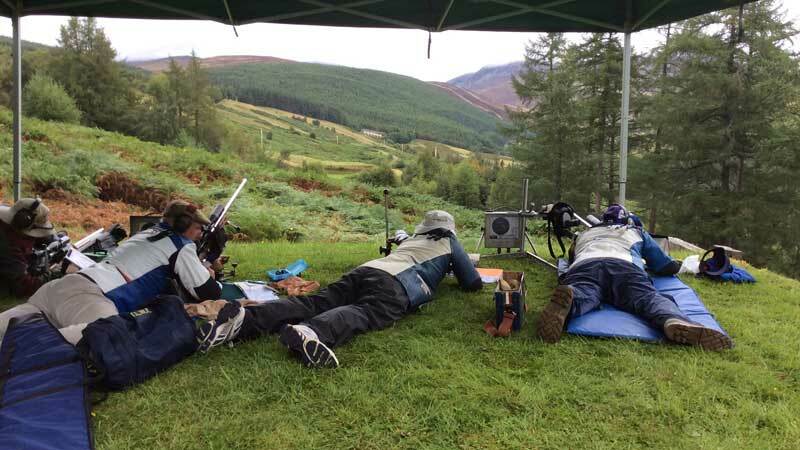 Match Rifle positions now range from desk-bound to fully recumbent - as so ably exploited by Julian Peck. What next? Sunday saw intermittent rain and a few quirks with the Kongsberg electronics but not such as to disturb progress towards the final results. 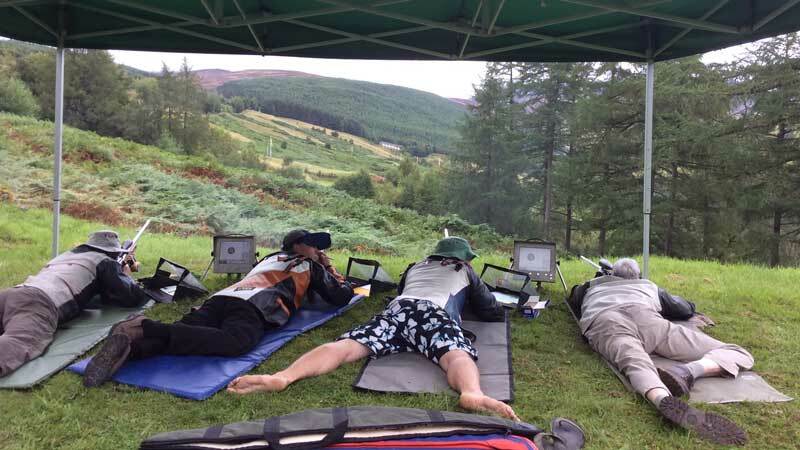 Mike Baillie-Hamilton, who had held back in a strategic sixth place overnight, stormed home at a full canter to win – dropping just one point in forty shots at 1114 and 1233 yards. Julian Peck clung on to his overnight second place, two points adrift, as did promising newcomer Ron Scaglione in Third place missing out by a handful of V-Bulls. Maitland Cup Tyro cup was won by Jim Brown. The pairs competition was won by Alex Cargill-Thompson and Mark Crichton-Maitland with Mike Judge and Neil Fyfe two V-Bulls behind. Prize giving was held under the gazebos with John Hissey handing out prizes and winners’ names being shouted over the noise of drumming rain on the canvas. But somehow this failed to dim the resolve of all present to return on the 2nd and 3rd of September next year. Someone is very pleased with his tyro prize!